Normally I would refrain from blogging about such a simple recipe. Hard to even call it a recipe, actually. Most people know too well how to roast ANY veggie. Cut it, coat pieces with olive oil, season lightly and into the oven it goes. But, I feel that this version is worth talking about as it exceeded my expectations. All you have to do is use coconut oil as the fat, and add some Southwest spice mix from Penzey’s or make your own version mixing the usual suspects listed in the ingredients. For my taste, this was 2 logs above the level of deliciousness of your regular roasted squash, demanding the exact same amount of work and time. That’s blog-worthy in my book! OVERVIEW OF THE RECIPE: cut a butternut squash in 1/2 inch to 1 inch chunks. Add to a large bowl. Melt 1 to 2 Tablespoons of coconut oil and drizzle all over. Sprinkle a nice amount of Southwest spice, a little extra salt, some freshly ground black pepper. Quickly toss it all together, the coconut oil will solidify and turn white again, do not worry about it. 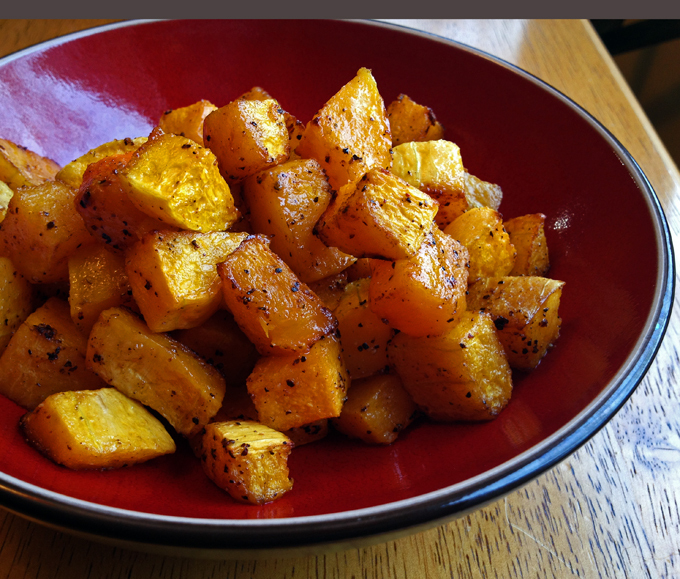 Place it as a single layer on a baking dish, and roast at 400 to 425 F until nicely brown, it should take a maximum of 30 minutes, depending on the size of the pieces of squash, and your chosen temperature. Adjusting seasoning with salt right after roasting. If you had issues to distribute the coconut oil evenly, move the pieces around a few minutes into the roasting. Since this was actually a non-recipe, I will include a bonus goodie by sharing the recipe for the pork tenderloin I served with it. Same approach as the basic 7-6-5 method blogged about years ago, but with a new type of marinade. Prepare the marinade by combining all the ingredients, whisking well. Place the tenderloin in a bag or shallow dish, pour the marinade all over, and place in the fridge for 2 to 12 hours. Overnight should be ok too. Remove the meat from the marinade, place the meat on the grill, close the lid and grill for 7 minutes. Turn the pork tenderloin over, close the lid again, and grill for 6 minutes. Don’t open the lid, just turn off the heat and keep the meat inside for 5 minutes. The internal temperature should be 145 F to 150 F. If not, close the lid and leave the meat for a few more minutes. Remove the meat to a serving platter and let it rest for 5 minutes before slicing. 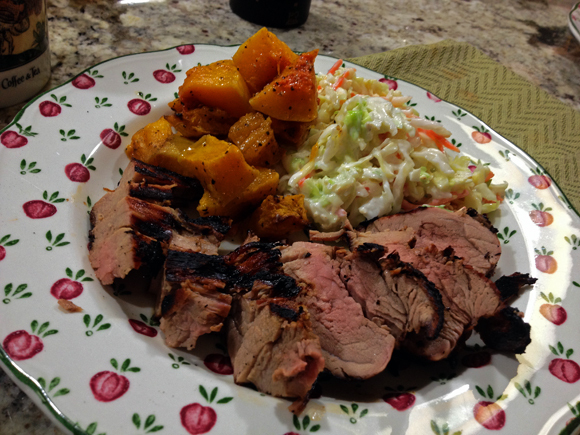 Pork tenderloin, roasted butternut squash & coleslaw.